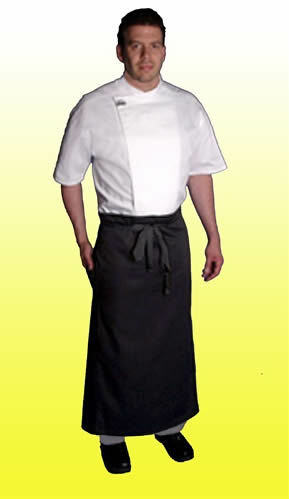 Chef Aprons & Kitchen Aprons ~ Long styles. High Quality kitchen aprons made in America. This is a finely styled and finely made longer waist apron, for when you need to present your very best. It measures 36" long and is 42" wide. The design includes two welt style pocket slits. 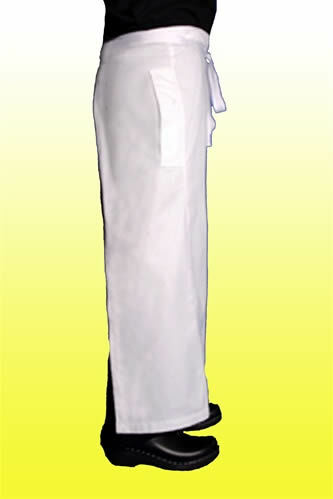 The pocket design is very clever, as it allows access to pant pockets that are underneath the apron, but from the front, the customers only sees a neat and trim apron. This is made from a great proprietary fabric – the Ultra PC 3000. The fabric is not only easy to clean, but resists staining, is easy to wash, and one shake out of the dryer and it is ready to wear. The waist ties are 42". Double needle stitching on the side seams gives it a certain level of dressiness, and the inside seams are finished with binding. Read more about the aprons. 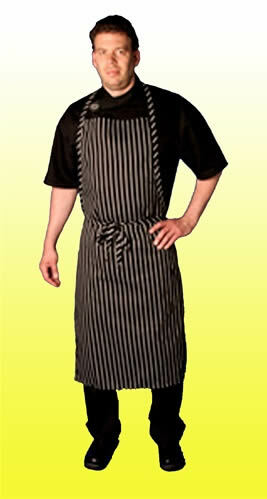 This terrific bib apron is made from 100% cotton in a black and white pin stripe pattern. It features a square neckline and comes with a fully adjustable slide on the neck strap. This slide allows the apron to be perfectly fitted to any size. The apron is 37" long by 34" wide. There are extra long waist ties - 42" long. This makes it very easy to bring the ties around your body and tied in the front. Bib aprons are terrific when you want to protect your shirt from the rigors of cooking. They're equally great for the home cook or professional chef. Read more about the aprons. Even if you don't actually work in a French bistro, you can look like you do! This full cut bistro apron is made out of Ultra PC 3000 – a poly cotton twill fabric that resists stains and washes beautifully. 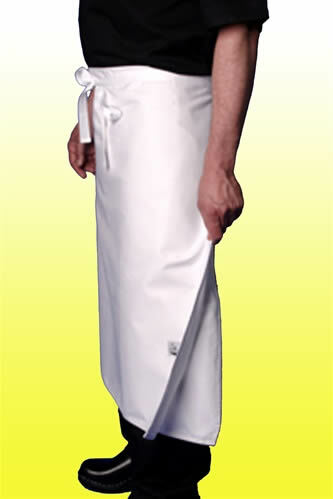 The bistro apron is 37" long by 34" wide. There are two patch pockets sewn onto each hip. The waist ties are extra long at 42". 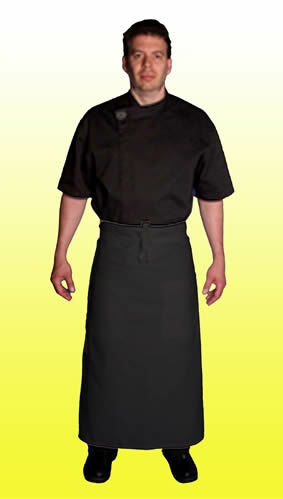 The extra length in the ties means that the apron can be tied at the front – which is the classic bistro look. Read more about the aprons. 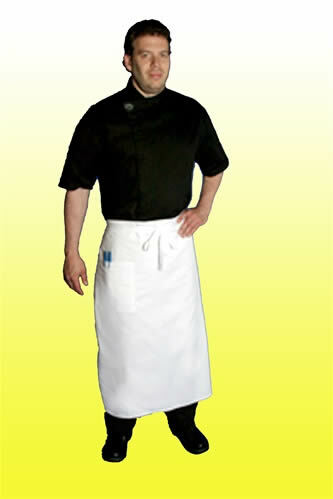 This classic styled long apron looks great time after time. Made from the excellent fabric, Ultra PC 3000, the fabric not only resists staining but it comes out of the wash looking great! The apron measures 42" wide by 36" long. There are two welt style pockets slits on the sides. These decorative slits allow you to get to the pockets of your pants without disturbing the look of the apron. The waist ties are 42" long. The inside seams are finished with binding and there is double needle along the side seams. Both of these finishing touches produce a superior looking apron and one that will last. Read more about the aprons. Long white aprons always look sharp, and this one is no exception. This is made with Ultra PC 3000 fabric – a poly cotton blend that washes beautifully. The apron is 37" long by 34" wide. There's a patch pocket on the right hip. The ties are a nice 42" long, so the apron can be tied in the front. When you need a high performing but stylish apron, this is a great choice! Read more about the aprons. 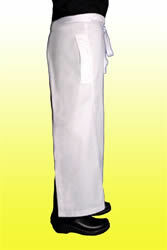 This crisp white 4-way apron is made from Ultra PC 3000 fabric. This is the fabric that is a poly cotton blend twill and is super durable. It does not pill up and comes out of the wash like it's almost new. The apron is 30" long by 30" wide. It has two reversible panels. There are 42" long grosgrain waist ties, allowing the apron to be tied in the front. This is a nice clean looking, easy care, high performing apron. Read more about the aprons. * Love these longer aprons but live outside the US? Contact us, tell us where you live and what you want to buy and we'll send you an exact shipping quote. About the Ultra PC 3000 Fabric: Ultra PC 3000 is a remarkable American made fabric. It's a 7 ounce brushed twill that's a blend of 65% poly and 35% cotton. This fabric is designed to repel stains. Even better, when you wash this, the dirt that comes off your garment will not redeposit on the other clothes in the wash. The fabric also has a moisture wicking property. So, when it gets hot in the kitchen, and you perspire, that moisture is wicked away from your body by the fabric. This aids in the natural evaporation of sweat, and helps to keep you cool. The clothes made out of this fabric come out of the wash ready to go. No ironing is needed – just a good shake and they look great! Once you buy a garment made out of Ultra PC 3000 you'll be hooked! Orders are processed securely through SaltChef.com and shipped to you directly from Comfortable Chef in Hackettstown, New Jersey. You will receive a shipment confirmation from Comfortable Chef when your order has shipped and tracking information within 24-48 hours of shipment. If you feel that you have received the wrong product, please contact Comfortable Chef customer service at 1-877-255-2433 within 72 hours of receiving the product. Returns are handled directly and only by Comfortable Chef. They have a 60 day return policy. Products must be returned in NEW condition and in original packaging. After 60 days you will incur a 15% restocking fee. No product returns can be accepted after 90 days.